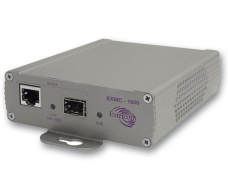 The EXMC-1000 Media Converter allows users to extend the size of their WLAN with the use of fiber cabling. The EXMC-1000 functions as a GbE range extender, providing fiber connectivity to Extricom access points and Extricom WLAN switches at distances of up to 700 meters*. The EXMC-1000 can be simply installed in any implementation and is connected to the WLAN switch or AP with Cat-5e/6 cable through a standard RJ45 port. Double the Range of Power Over Ethernet - Extends reach of Extricom WLAN to 700 meters. Simple Install - Connectivity via Cat-5e/6 cable and integrated SFP. 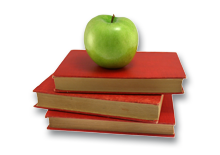 Deployment Flexibility - Requires only one power supply, greatly simplifying power infrastructure planning. 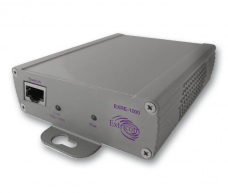 The EXRE-1000 Power Over Ethernet Gigabit (PoE) Range Extender is a unique product that doubles the standard range of PoE, from the baseline 100 meters to a full 200 meters, all while enabling full gigabit speed. It can be used both as a standalone product, to extend the reach of PoE installations, and as a complement to Extricom’s award-winning Wireless LAN (WLAN) System. Double the Range of Power Over Ethernet - The EXRE-1000 doubles the standard range of PoE, from 100 to 200 meters. No Power Supply Needed - The Range Extender is powered by the incoming PoE, enabling simple in-line installation. It uses the incoming PoE to then inject a re-energized signal to the line.